Grilled chicken breast isn't really about the meat itself but the way it's seasoned or sauced. Here are nine ways to flavor your chicken so it's anything but plain. You can rarely go wrong with a lemon-herb sauce, especially one crafted by superstar chef Francis Mallmann. Chicken breast lets the sweet, mellow flavor of red peppers shine. Blend sun-dried tomatoes with a caraway-spiced roasted red pepper relish or olives and capers with pickled Peppadews for easy, but complex-tasting sauces. There's no faster way to add flavor to chicken breast than to use Southeast Asian ingredients. A marinade spiked with fish sauce adds an incredible savory depth, while a garlicky-vinegar sauce hits a lot of spots on the tongue. 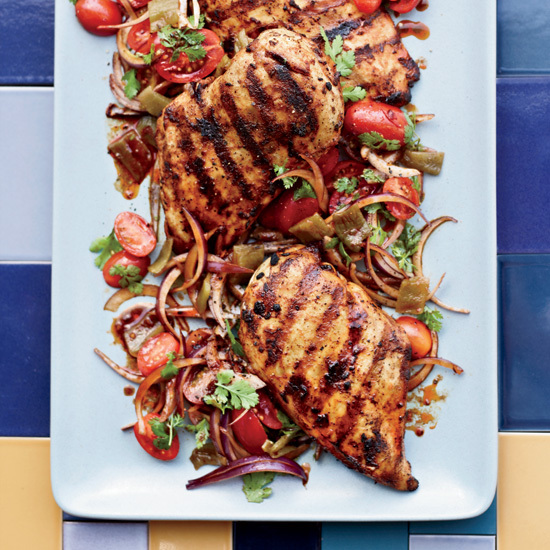 Or serve plain chicken with a smoky grilled chile relish. If you can't deal with the fish sauce but love the other bright flavors, try this easy, spicy vinaigrette. Love Korean barbecue? Try the classic gingery, garlicky, sweet-savory marinade on chicken breast. Use store-bought or make your own. Either way, rub this warmly spicy north African chile paste all over chicken before grilling and serve with a salad. Whether you do a straightforward vinegary cabbage slaw, one with the exotically named kohlrabi or one with green beans, these crunchy, lacy salads are perfect toppings for grilled chicken breast. Cooling yogurt sauces are terrific with anything spicy, including chile-rubbed or black peppery chicken. Make it with cucumbers for a little crunch, or tahini for a delicious nutty flavor. No, this isn't a bad 1990s food nightmare. Ice cream maven Jeni Britton Bauer marinates chicken breast in mango sorbet to create a sweet-and-tangy crust as it grills.